While we were at Yellowhammer, Daniel learned a new temporary hoof protection strategy from Guy Buck, an endurance farrier here in the Southeast. When I saw the pictures and heard about this, I was excited and decided to play with that this winter while my horses are barefoot. I usually play with Easyboots (which are misnamed in my opinion), but this seemed a much better use of my time and money. So, what is it? Fiberglass casting tape. 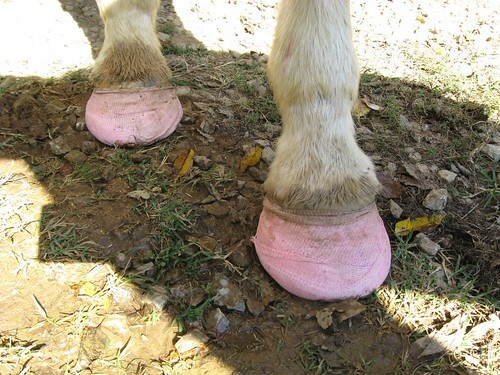 If you can wrap your horse's hoof with vet wrap, you can wrap with casting tape. There's actually a product out there marketed to horse owners, but there's no need for a special product. Just use the same casting tape your doctor uses to stabilize that broken arm (or thumb or leg or...). So where do you get such a thing? eBay, of course, where else? You want 2 inch fiberglass casting tape. If you don't care about the color, you get a better price. I paid $2.65 per roll from eBay. One roll is good for one hoof. 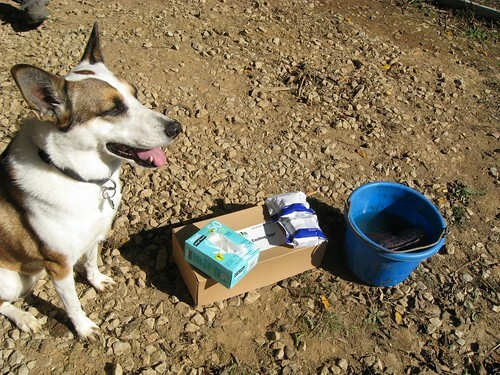 So you need to gather your supplies. Your horse, with reasonably clean feet (just knock the dirt off). Doesn't need to be dry. You're going to wet the tape anyway. Put your gloves on and open the casting tape package. Take the roll of tape and dunk it in the water. Squeeze it while in the water several times. Pick up your horse's foot and proceed to wrap. Stay off the heel bulbs and stay below the hair line. 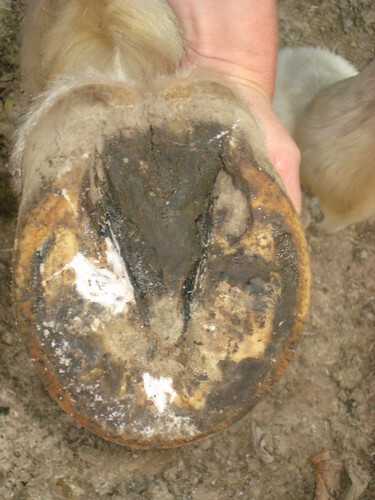 Try to keep the thickness even along the bottom of the hoof. I prefer to leave some of the sole exposed rather than close it off completely. You can use the entire roll but for a smaller hoof, you don't have to use the whole roll. When you're done wrapping, smooth it all down and set the foot on the sponge on the ground. 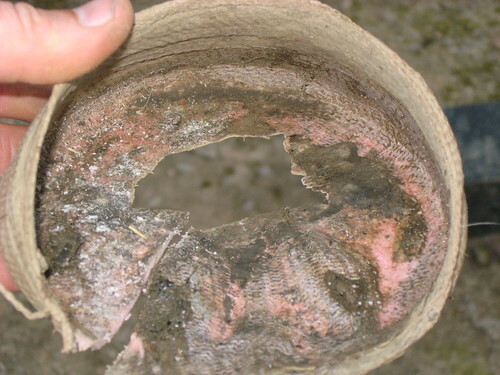 Doing this will have the sponge push the cast into the foot and form to the horse's foot. Right away make sure the casting tape is off the hair line. If it crept up there, just push it down with your fingers before it hardens. After about a minute, you can remove the sponge. 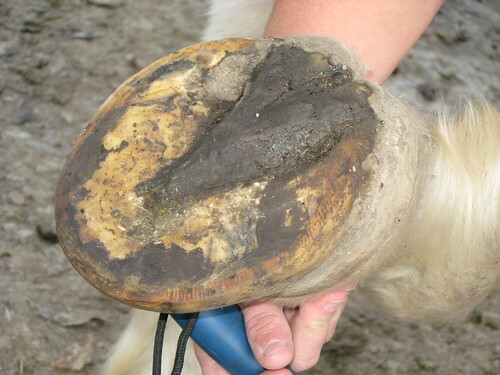 This is a picture of the first hoof I did after the cast set up. I left the sponge on a little too long. Some of the sponge stuck to the bottom. It's a cheap sponge, so no worries. For our first test, I just wrapped Serts' front hooves. His shoes had just been pulled by my farrier. I left him to run in the pasture. I checked him every day and didn't see an issue. It was super muddy for the first few days and I thought we'd lose the casts, but that was not a problem. 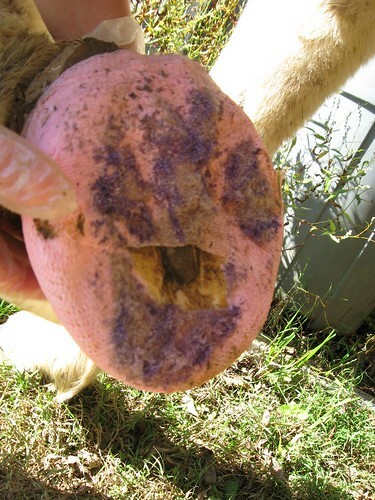 The pink casts actually ended up the color of hoof wall. I couldn't tell until I was right by him if he still had his casts! We finally removed the casts after a week to inspect his soles. These are his hooves with casts just before we removed the casts. Removing the casts was a challenge. Daniel actually used a small, dull hand saw, but we'll look for something better. A true cast saw would be a bit expensive for this! Serts' soles looked great. A little dead sole that hadn't had abrasion to remove it, but that's not a problem. The hoof wall on the front had a minor imprint of the casting material, but again, not an issue at all. Serts' feet looked wonderful. There was very little wear on the casts. Granted, Serts was in a pasture and not ridden, but he did wear them for a week straight. The next test will be to do some training rides to see how he moves in them and determine the traction on grass and pavement. Just to be clear, I'm not looking at this as a replacement for metal shoes. I'm looking at this for a spare tire when riding and for temporary riding protection during winter when I like to let the horses run barefoot. I still have several tests, but it's certainly an interesting prospect. Defintely food for thought. Thanks for sharing the idea!! Love to hear if you have tried any more tests with this! I'd sure be game to carry a roll in my saddle bag. Have you done any riding with them yet? I'm curious to know how long they last on a trail. How long do they say it takes to fully cure the cast? This may be exactly what I need for my TWH with a club hoof and 18% rotation in his coffin bone. 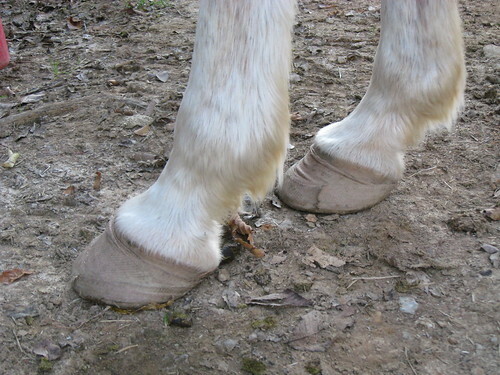 He can't go barefoot as his hoof falls apart and must have a pad or he will sore. You could seal a pad in it couldn't you? How long do you think they will last? Unfortunately, I haven't ridden with them since the initial test. I gave my boys a break and now it's too cold for this girl to ride! I do plan on using these over shoes during my spring training. I definitely haven't abandoned the idea! I can say that I will have at least one roll on my saddle for emergencies. Michele, I can't see why you couldn't use a pad under these. My horse wore his in the pasture for a week. I'll wait for warmer weather for more tests! Have you giving the cast another chance? Im very interested to hear any feedback you have. I am beginning the transition to barefoot and unfortunately my horse's hooves are not the right shape for easyboots (a whole inch longer than they are wide). Sandy, I have used the casts a couple times on Tanna. He is pretty hard on the casts in the pasture. He moves around so much! But they still last pretty well. If the weather would break, I'll try them again. But it's too cold for me to ride yet! Shoes go back on in a couple weeks, so short window of opportunity. But I would definitely try them if I was transitioning to barefoot. I cast using Equicast the weave is larger, prevents anaerobic activity and besides resin there is some polypropylene in the mix so they last much longer. But they cost more. 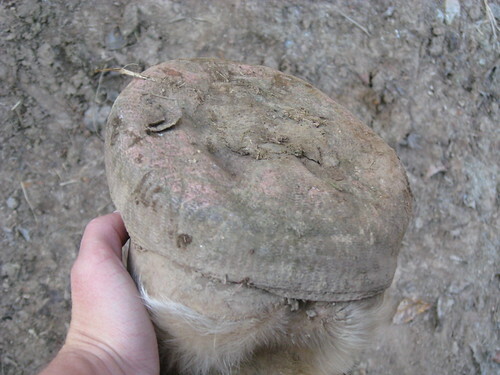 I've used the Perfect Hoof Wear and now have ordered the casting material from eBay as you suggest. KC of PHW, said when you want to remove the casting material to take it off like a shoe. Get your shoe pullers at the heel and peel. I used them with inserts that KC sells. Next I'm going to try the casts with the Natural Balance Polysteel shoe. I trim my own but I don't want to learn to shoe. Glueing has been hopeless for me.